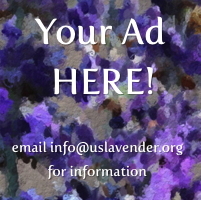 If you are a lavender lover and grower, you have discovered that if bees are nearby, they love lavender in bloom. 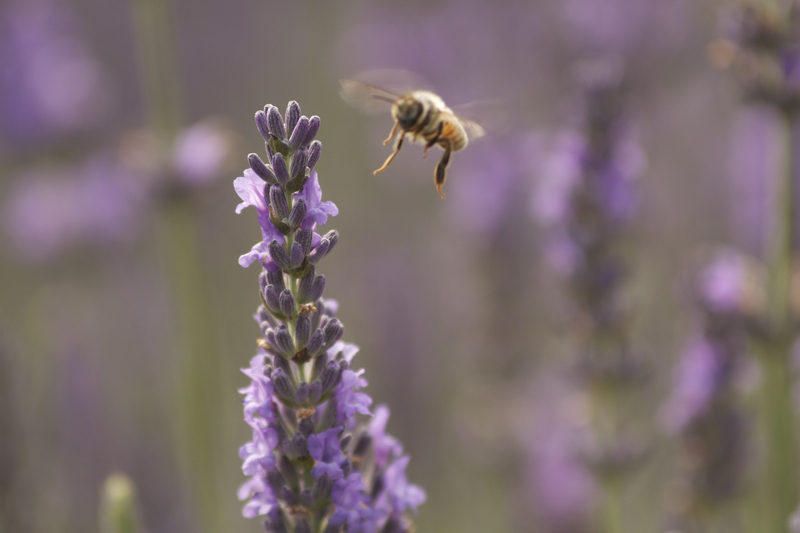 Lavender and bees are, simply put, very good friends! There are varying thoughts on bees and the flavor of their honey, but since bees will travel up to 6.5 miles from their hive, unless you own half the county, few hives will have honey from only one source. But, simply put, bees love lavender in bloom, as they love anything in bloom where they can get nectar or pollen. While lavender growers have varying purposes for growing the type of lavender they grow or even the color of the blooms or length of stems, bees have discarded human reasoning, for they tend to be both smarter and less discriminating than lavender growers are! Some lavender growers may want to leave a certain percentage of plants uncut at harvest time, and the bees will say a collective ‘thank you’ to this practice. There can be no doubt that L. Angustifolia varieties, which bloom either continuously or multiple times, offer a greater opportunity for bees to have a regular ‘diet’ of lavender pollen and nectar.You might even grow some varieties which seem less suitable for your purposes as a lavender grower and let them bloom as long as they want and the bees will find that practice quite compatible to their ‘mission’ to sustain their hive and produce honey. As you have relaxing moments, tour your gardens of perennials, herbs, vegetables and especially lavender, and when you see bees present on the blooms, increase the number of those plants in subsequent years … and as time moves on, you will see thousands of bees everywhere you walk. On our farm, we are ‘friends’, and can go close to the hives, weed while they work among blooms, and find the farm a place where we can peaceably cohabit and enjoy life together. Do not wear perfume … bees would rather smell you sweaty. If you have aggressive bees, best try bees from another source … because most bees today are pretty calm, not aggressive, and prefer to enjoy life with you, not against you! Do NOT use chemicals on plants in bloom … bees can take the insecticide with them back to the hive and kill themselves and a ton of their co-workers! If you are new to beekeeping, there are associations of beekeepers across the country, and many of them have regular (at least annual) workshops for beginners. There is nothing better than finding fellowship with other beekeepers, just as those of us who are lavender growers enjoy each others company. If you’re looking for ONE good resource on beekeeping, a must in your library is The Hive and the Honey Bee, first written about 1850, expanded and updated regularly, and published by Dadant and Sons of Hamilton, Illinois. It’s 1300 pages is full of invaluable resources!